Here’s a thought to close the loop on my rant about impersonal communications earlier this week. One thing that social media seems to be good at is helping us find ourselves one bite (or byte) at a time. There’s the quote of the day. the word search which is skewed to help us find a meaningful word, the pictures with the inspirational quotes on them, and the all popular smarmy ecards. There’s times I look at those and have one of two thoughts. Maybe they’re cynical. Yeah, they are. First: They could have been written by Mork and Mindy’s bumpy neighbor. That guy wrote greeting cards and he was a jerk. Mork’s neighbor could be writing your deep thought of the day. Ewww. Second: They feel kind of good and share a point. But it’s pretty minor and it’s mostly for the person who posted it. Of course I thought about myself. I’m interesting! Skimming a news feed can be hit or miss and there are some things which grab attention more than others. Interactions which are better hits than others create connection. Think back to the last thing you saw someone post which got a significant number of engagement. Connection is the key because it’s something people relate to – it’s even better if they’re people that you know. Take even this simple example. 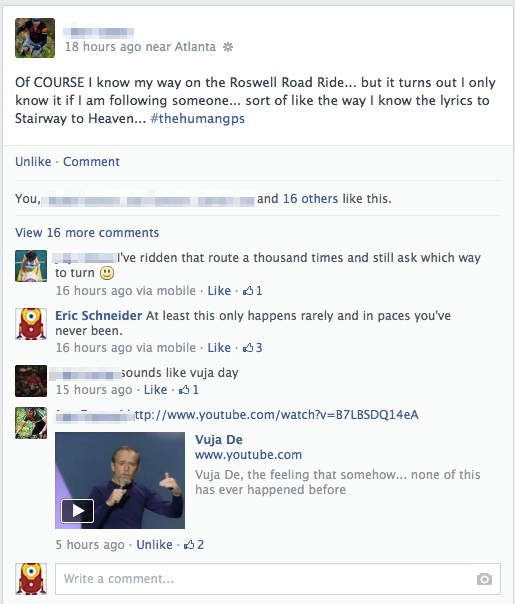 One of my friends got lost on a road ride he does every week. He gets lost on mountain bikes too. It’s not that he’s a natural born leader, it’s just that he doesn’t know the way and his friends have that figured out. It’s the connection that caused people to gravitate and give him #monopolyshit. When even the arrows painted on the road don’t cut it. Of course, that’s how I ended up with a Minion version of Iron Man as a profile picture too. One of my friends saw The Avengers recreated as Minions, remembered my love for them both, and made that connection. Whether it’s business or personal, you’ll find you get more traction with others when you pass along cute superheroes than impersonal sound bites.